It has often amused me that the most arctic living of the deer species, i.e. reindeer and caribou are not called ‘snow deer’. Apart from the obvious and appropriate descriptive title of an animal so ‘at home’ in the snow, I have always thought it would have been a rather attractive name for them as well! There are plenty of occasions over the winter when our reindeer experience truly arctic conditions and so for me anyway in winter they become our ‘snow deer’. Part of the Cairngorm herd spends the winter on the Cromdale hills, which are situated to the north east of the Cairngorm mountain massif. Despite not being as high as the Cairngorms and so not quite the same exposure to wintry weather, the Cromdales still get their fair share of snow and so our ’snow deer’ here can experience pretty wild conditions. These are a few photos taken a couple of years ago when in blizzard conditions our snow deer were quite at home. Not sure the same can be said for me! Us humans feel the cold even when completely wrapped up! There are no winter conditions that drive these animals off the hill. They have incredible soft thick coat which provide all the insulation they need against the cold. Their broad flat feet make it both easy for them to walk across the snow and dig down through the snow to their favourite winter food, lichen and in blizzard conditions they face the prevailing wind which keeps their coats ‘flat’ and so trapping air between the hairs to create another insulating layer. It does mean though that they end up with ‘ice packs’ on their foreheads. Whilst they don’t worry about the snow, the reindeer will close their eyes to stop it swirling in. Knowing how well adapted they are to snow, many people ask me whether reindeer like the milder weather we have come to experience more of in recent years. Indeed as I write this today, the 24th January 2016 the day is decidedly ‘spring like’, there’s no snow, no wind or rain, the grass is looking quite green and I can wander around outside without a jacket on. As far as our reindeer are concerned I suspect it just makes it easier for them, as they don’t need to expend energy digging down through the snow to find food. But that’s not to say they wouldn’t prefer to be lying on a soft bed of snow. We were delighted, if a little surprised, to find out that our leaflet had been entered into a competition by Landmark Press for best design, and amazingly, we won! Puddock was pleased to accept the award on our behalf! Thanks Landmark Press, and well done Emily for her awesome designing skills! Once the herd are spied, it just takes a call to get them thundering towards you (on a good day). Not just any call though – they can differentiate between a herder and a tourist! When it’s snowy, the easiest route is often straight down the main road – thankfully pretty quiet at this time of day. Off the road and we start cutting across and downhill. Glenshee is delighted to lead the way – it’s often the calves who are the greediest and most confident! The intended route – down the steep slope to the bridge, over the river and up the other side to the enclosure. The gate in is near the shed. Sometimes there’s a bit of hesitation at the top of the bank, but today the girls were happy to come straight down. Down the slope and onto the bridge. I’m always amused by the herd trotting neatly over the bridge in single file – why get wet feet when you don’t have to – great trail left down the hill too. Reindeer will walk single file through the snow to conserve energy. Along the path up the other side – if you’ve been on our hill visit you may recognise this path! Sometimes the girls charge past up the hill, but today they were content to potter along behind. … and in through the enclosure gate. We often feed the free-ranging reindeer inside the hill enclosure, with the gates left open, as it gives them a bit more safety from being hassled by dogs. Food out as their reward as the snow sets in – happy reindeer and happy herders – just 10 minutes after we set off, a successful morning complete. 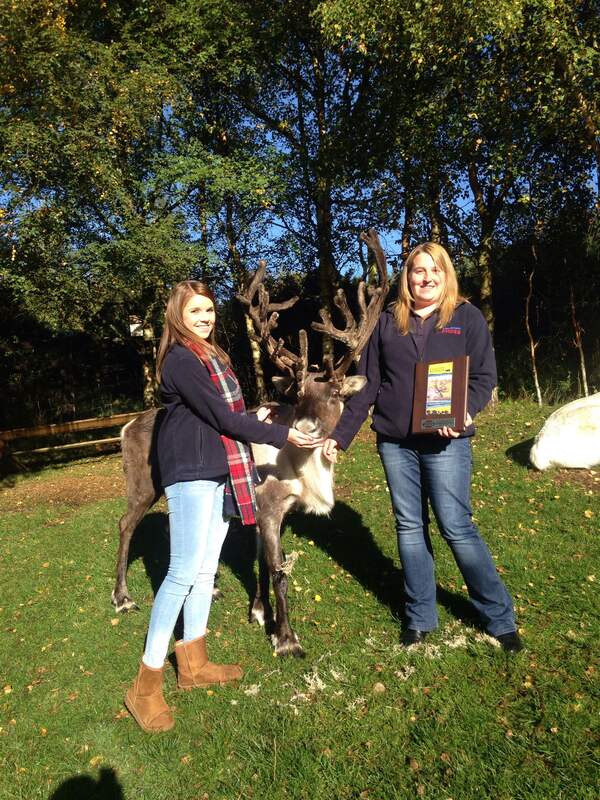 As the schools go back, and the Christmas decorations, sleighs and harness are packed away at the end of another busy but successful season, the Reindeer Centre closes its doors to the public for a wee break. Of course we don’t get an actual holiday, the reindeer still like to be fed, but we put every single member of the herd out to free-range on the mountains. The boys head on over to the Cromdale mountains (where their lazy habit of hanging out on car parks can be prevented!) whilst most of the cows and calves go onto the Cairngorm range. The enclosure, and paddocks down in Glenmore, stand empty. Every day we still drive up the mountain road early, spying for reindeer. Sometimes they make our job easy, like when the herd decide to get our attention and wait on the car park. It’s a bit of a giveaway when we see a traffic jam in an unusual place – you can guarantee there are a few females hanging out at the front of it, with excited tourists abandoning their cars to take photos! Other times we spot the reindeer a long way away, and on a good day they’ll hear you calling and run a mile or more to reach you. One of my favourite moments is when you see the distant dots on a faraway mountainside suddenly start streaming down towards you, looking alarmingly similar to ants until they transform into reindeer! Winter is when the reindeer are in their element and whilst they’re always delighted to see us, if the weather prevents us finding them for a few days, or they decide to not be found, it quickly becomes apparent that they don’t need us. Their metabolisms slow right down in the winter months, and with shovel-like feet they have no difficulty digging through the snow for food. Lilac, a bit of a legend at an incredible 16 1/2 years old, has a stretch after a nap. We often leave the top part of the hill enclosure open so the free-ranging reindeer can join us to ‘request’ food, whilst safely out of the way of hill-walkers and dogs. Whilst it makes life fairly unpredictable (Will we find the reindeer? Will they come to call? Will I have to hike up a mountain in the snow and wind with a massive sack of feed on my back???) it’s a really fun time of the year, and great to see the reindeer loving life in their natural habitat. “Mum, you’re embarrassing me…” Merrick looking sheepish as mum Nepal gives him a good wash round the ears. As December dawned upon Glenmore the word ‘Christmas Fun’ began to be whispered amongst the herders, tinsel appeared and Christmas sneezed upon the Reindeer Centre once more. The Christmas period is one of our busiest times of year and we feel we should do something a wee bit extra special this is where Christmas Fun begins. Over December we arm ourselves with Christmas cheer and crafting supplies and head to the paddocks. An army of extra herders appear and we make decorations, Christmas hands and even help Santa himself – he valiantly mans the paddocks and gets all the last minute Christmas requests! 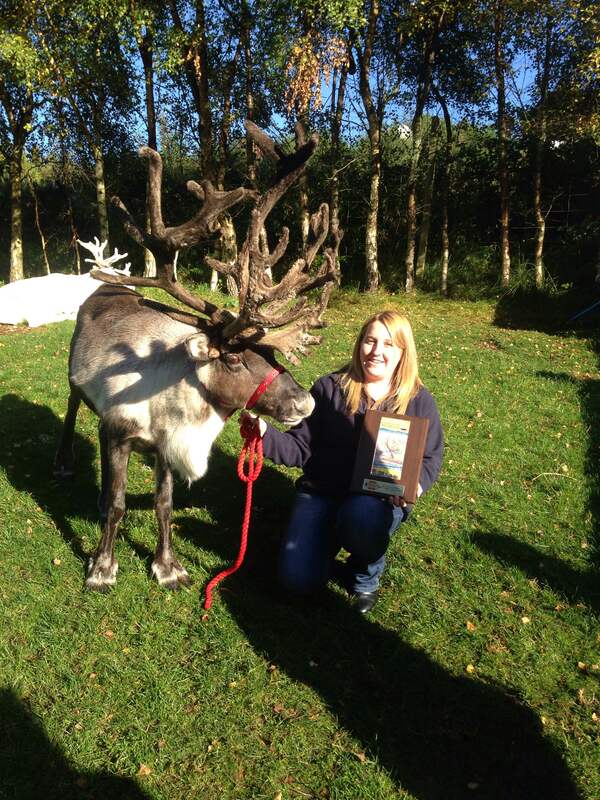 Santa even had time to meet two very unusual little reindeer! We even had a major reindeer herding success when one afternoon before Christmas when myself and Imogen went for a shwizzle around the mountain roads to check for any rogue reindeer. We do this daily as the girls have a great habit of creating some rather impressive traffic jams and if so we swoop in like a reindeer removal squad and deposit them atop a ridge with some yummy food. 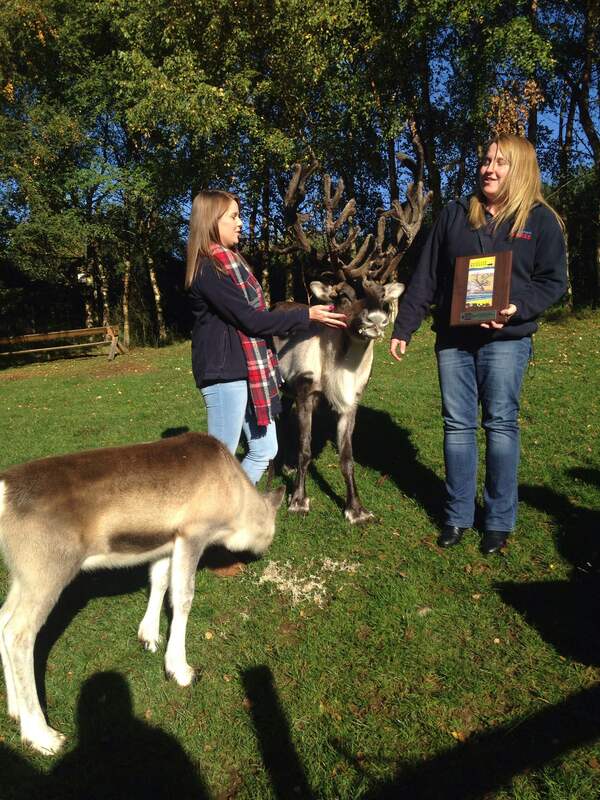 It’s also a great wee break from Christmas madness down at Reindeer Hoose! This time we had a very specific mission to seek out Lulu and her lovely calf Bhuachaille who had not been seen properly since September! October is usually our month for training our wee calfies to wear a head collar but wee Bhuachaille managed to miss out on all of this! The mission was bring him in and halter train him so he could participate in our Christmas day parades. We drove up the road and saw nothing, went to the ski-ing carpark and again saw nothing promising until we spotted a loitering car then one reindeer… then 24 reindeer including Lulu! I ran down the carpark and caught Lulu so fast I forgot about getting a head collar (thank god for Imogen!) and then forgot to take off my mittens so once again required assistance. In a space of one minute we had Lulu haltered and were heading with the herd to the hill enclosure with Bhuachaille in tow. Not bad for just a wee afternoon drive! Creative Christmas wishes, beautifully made in our paddocks! The ultimate day is Christmas Eve, definitely one of the busiest days of the year and the team that day was Andi, Hen, Sheena, Imogen, Abby, Anne and a very festive Shona! We took the busiest visit of the year, and to our knowledge of all time, with a whopping 51 cars on the visit! Have a look at all the people! Just one or two visitors on Christmas Eve! We all survived Christmas fun and even wore some very stylish jumpers! A triumphant Christmas eve team! Hope you all have had a wonderful Hogmanay!